After centuries of being trapped in the ice under the curse of the Black Wizard, Aran the legendary Hero has finally woken up. He has lost all memories from the past and his abilities. Awaiting his awakening at his side is a girl named Lirin. Lirin is the last member of the clan that believed in the resurrection of the Aran. Day by day, with the help of Lirin and other member of the clan, Aran is slowly regaining his memories and beginning to adjust to this civilization. With adequate training, the hero will be able to regain all his abilities and power that have laid dormant for the past centuries. 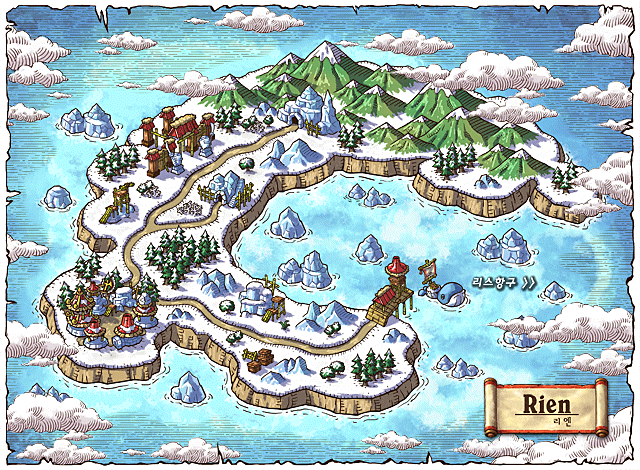 To prevent Aran from getting lost from his regular training in the woods, Lirin and her friends have provided Aran with a map of Rien. To travel from Rien to Victoria Island and other parts of the land, visit the Penguin Port. There are various arrows to show you the way to the harbor, just follow the arrow and you will arrive at the Penguin Port in no time. Speak to Puro and pay a travelling fee of few hundred mesos and off you go to Victoria Island. Recovery of Aran’s abilities and memories would not be successful if not for the help from Lirin, Maha, Tru, and the penguins that are residing in Rien. Upon creating an Aran class character in MapleSEA, you will automatically take on the role of a member of the Aran clan. As a recently awoken hero, you will be aided by Lirin and various in-game characters as you relearn the skills that lie dormant in you. As a legend, you will first assist Athena Pierce to find the lost kid before travelling to your destined land. Soon, you realize that you are destined to follow the path according to the quests as planned. Pole Arm Combo: Enables the visibility of combo counts. After every 10 combo counts, your stats will increase by a certain amount up to a maximum of ten times. This buff disappears when you lose your combo count. Requires 10 SP in Double Swing. Note: You can obtain this skill after completing a special quest at Level 13. Double Attack: Press the attack key twice to attack up to 12 surrounding monsters two times. Combat Step: Press the arrow keys twice to move to a far distance at fast speed. Requires 5 SP in Double Swing. Polearm Booster: By using HP and MP, the attack speed of the polearm temporarily increases. Can only be used when having a polearm equipped. Requires 5 SP in Combat Step. Note: You can obtain this skill after completing a special quest at Level 22. Polearm Mastery: Increases the mastery as well as accuracy. Only applied with a polearm equipped. Requires 3 SP in Triple Swing. Note: You can obtain this skill after completing a special quest at Level 31. Triple Attack: Press the attack key three times to attack up to 12 surrounding monsters thrice. Requires 20 SP in Double Swing. Pole Arm Push: Push monsters in front of you. You have to use Triple Swing first before using this skill. Requires 20 SP in Triple Swing. Combo Drain: For a certain amount of time, you will absorb some HP of the damage dealt to the monster. Requires 1 SP in Combo Ability. Combo Smash: Throw a polearm that penetrates a certain amount of monsters in the direction you are facing. Requires 1 SP in Combo Ability. Body Pressure: For a short period of time, you can attack monsters with your own body. The attacked monster has a small probability to get stunned for 5 seconds. Full Swing: Increases the damage of Double Swing and Triple Swing. Requires 20 SP in Triple Swing. Critical Combo: Allows you to perform a critical attack with a certain success rate. For every 10 combos, your critical damage and the chance of a critical attack goes up from a default of 100% damage and 10% chance of performing a critical attack. Requires 10 SP in Combo Ability. Pole Arm Toss: Toss up to 12 monsters in the air. If you attack monsters in the air, they will receive additional damage. You have to use Triple Swing first before using this skill. Requires 20 SP in Triple Swing. Fenrir Phantom: The soul of the wolf is summoned and merged into the sword to attack monsters twice in a wide range. Requires 10 SP in Combo Smash. Snow Charge: Adds an ice element to the polearm for a short period of time. The monster’s speed will decrease after being attacked. Smart Knock-back: Lower the damage required to knockback a monster. Whirlwind: Push monsters away to the left and right side with a powerful wind. Maple Warrior: Increase all players’ stats within a party by certain percentage. Aggression: Increases the polearm mastery as well as weapon attack. Requires 20 SP in Polearm Mastery. Over Swing: Increases the damage of Double Swing and Triple Swing to the extreme. Requires 20 SP in Full Swing. High Class Defense: Permanently increases the weapon defense of one’s armor. Pole Arm Finale: Swing your polearm widely to deliver a fierce attack to a maximum of 12 monsters. You have to use Triple Swing first before using this skill. Requires 20 SP in Triple Swing. Tempest: Freezes the surrounding monsters. If a monster is frozen using this skill it will die instantly upon attack. If used against a boss monster, it deals four consecutive hits of powerful damage. Requires 10 SP in Combo Peril. EZ Shield: Grants a buff that makes party members to receive less damage for a limited time. Requires 10 SP in Combo Drain. Freezing Posture: Infusing the weight of a frozen glacier, prevent you from being pushed back by a monster’s attack. Aran characters who have yet to obtain particular Aran skill are able to preview the upcoming new skills in the Aran skill window. Aran class shares the same Equipment and Weapon as Warrior. Aran, the Resurrected Hero will have their own exclusive wardrobe to suit their aristocratic status. During the event period of 18th Nov to 16th Jan 2010, an ice cube will be given to player when they login to MapleStory. The ice cube can be traded for a Maha’s Charm when you stayed in-game after one hour. With the Maha’s Charm in hand, Cassandra will give you a very simple question about Aran. With the correct answer provided to Cassandra, she will then provide you with either 1. Aran’s Ice Box, 2. Lirin’s Ice Box or 3.Aran Paper Box. So what do you do when you receive one of the prizes from Cassandra? If you received Aran Paper Box, double click on the box to receive random in-game items from the lucky box. If you received Aran’s Ice Box or Lirin’s Ice Box, keep it in your inventory and there will a draw every week that will be giving out mystery prizes to the lucky draw winners. There will 10 winners for each week to win away our mystery prizes. Since the event is running for a total of 4 weeks (from 16th Dec 2009 until 16th Jan 2010), total of 40 physical items will be given away free!! Keep your lucky draw ticket (Aran’s Ice Box or Lirin’s Ice Box) today! Be rewarded with your hardwork! Once you reach level 50 with your Aran character, Lirin will reward you with Lirin’s ring. Are you training hard for your combos? As a token of appreciation to all the dedicated players, we would like to reward you with your hardwork and determination. Now, this is your chance? Why imagine when you can get to visit Nexon for a day and get to meet the developers personally? For more information of our Exclusive Aran Events, visit http://maple.playpark.net/aran/ingame_events/ & http://maple.playpark.net/aran/contests/. Launch of a New World – Izar in SG Gateway! Arising star from the universe, Izar has arrived in Maple! As a newly star in our constellation, our administrators from Izar have organized a series of new events to welcome all new dwellers. Receive a bandanna exclusive to Izar world when you hit level 10, 30 and 50. Simply meet the level requirement and talk to NPC Joyce. Level Requirement: 0, STR +1, DEX +1, INT +1, LUK +1, Weapon Defense 15. Level Requirement: 30, STR +3, DEX +3, INT +3, LUK +3, Weapon Defense 40, Speed +5. Work hand-in-hand with the Game Masters as they will be helping Maplers to obtain the highly desired Zakum Helmet! Available to Izar for Maplers at level 50 and above!! There will only be 10 players (5 for Brown Work Glove & 5 for White Polar Bear Chair) who will be able to exchange their trophies for the prizes. Will you be the lucky one? *Please note that MTS system will not be available in Izar World. Are you a vivid lover of all the titles and medals and wish to acquire as many titles & medals as you can? Then this Tile & Medal window is specially designed for you! With this Title & Medal window, you will be able to preview all your existing titles & medals and many others you have yet to acquire. Let’s make this your collection book for all your titles and medals! Sections available: Basic, Job, Normal, Challenge and Event. 1. Allocate the Title Button on your key configuration according to your preference. 2. Press the assigned key to open the Title & Medal window. 3. You will be able to view all titles available, all new addition of title(s), in progress and achieved titles in this window. New distribution formula will be implemented in Version 0.86 to prevent leeching of EXP among party members in MapleStory. Looking forward to start an Aran character and at the same time fretting over which existing character slot to delete to make way for the resurrected Hero? Now your problem is solved! Addition character slot will be provided in Version 0.86 patch to existing game accounts with maximum character slots. So, don’t worry and create a new Aran character to take part in all our specially planned for you events in Maple without deleting any of your existing character. Prior to Version 0.86 patch, the maximum character slot for each registered Game Account ID is capped at 12. With Version 0.86 patch, the maximum character slot for each registered Game Account ID will be capped at 15. Great news for all adventurer characters! New additional skills will have 150% damage on monsters. Are you asking what the skills are? Several skills effect of Adventurers’ skill has been revised to match the distinctive requirement of the different levels. Each skill effect will be different by Level 10, 15, 20 and 25. Let’s take a look at the list of skills that will be revised accordingly. Hoping to have higher damage when you were a beginner in MapleStory? Now your wish has come true! After the v0.86 patch, all beginners’ weapons will have improved stats to provide you for the competitive world. Train hard and you will be able to upgrade your armors and weapons in no time! 1. For Easy Balrog Expedition Squad (from level 50 – 70, maximum 6 users), you have to select all other channels except channel 4 and channel 9 for the Quest. 2. For Normal Balrog Expedition Squad (from level 71 and above, maximum 6 users), you have to select channel 4 and channel 9 for the Quest. Listen up all loving couples, marry your loved one before 31st Dec 2009 and you will get to receive exclusive love tokens from us! Yes, you are seeing correctly! This newly invented Coupon is finally on sale in our Cash Shop so you can now fully concentrate on training your character. This Coupon will only be on sale for a limited time only, grab it fast before it’s gone! Want to know how you can play around with your Cash Shop EXP Coupon? - There will be 3X EXP coupons and 2X EXP coupons on sale. – Furthermore, we have our School Break 2X EXP Event coming too. Note: Izar 24 Hours 2X EXP Event is available from 18th Nov ~ 9th Dec 2009. Besides having the chance to participate in our ‘Win a Trip to Korea’, we are organizing another in-game event for avid heroes to participate. With the official launch of Aran on 18th Nov 2009, the challenge of the Top Aran Class Character in each server will begin. The Top Resurrected Hero, Aran will be selected based on the Level and EXP achieved on 8th Dec 2009 2359hrs (+8 GMT). In the event that there are several characters with the same highest level, the chosen winner will be the hero who achieved the highest level at the fastest time. There will only be 1 winner per world, and what exactly is the prize for this event? Item can be used to perform the stimulated skill effect while using skills except for Somersault Kick, Octopus and Triple Attack. After implementation of Version 0.86 patch, expired pendant(s) will not be shown on the Character Equipment window. Finally, new hair style and new face for both genders! Makeover time has come and being a good helper, I will give you more tips as to where to get the newly released hair style and face!